The orifice plate is the simplest of the flowpath restrictions used in flow detection, as well as the most economical. Orifice plates are flat plates 1/16 to 1/4 inch thick. They are normally mounted between a pair of flanges and are installed in a straight run of smooth pipe to avoid disturbance of flow patterns from fittings and valves. 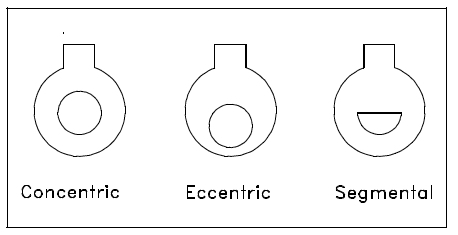 Three kinds of orifice plates are used: concentric, eccentric, and segmental (as shown in Figure 1). 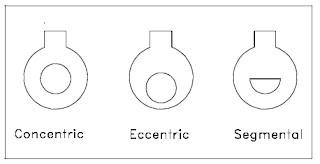 The concentric orifice plate is the most common of the three types. As shown, the orifice is equidistant (concentric) to the inside diameter of the pipe. Flow through a sharp-edged orifice plate is characterized by a change in velocity. As the fluid passes through the orifice, the fluid converges, and the velocity of the fluid increases to a maximum value. At this point, the pressure is at a minimum value. As the fluid diverges to fill the entire pipe area, the velocity decreases back to the original value. The pressure increases to about 60% to 80% of the original input value. The pressure loss is irrecoverable; therefore, the output pressure will always be less than the input pressure. The pressures on both sides of the orifice are measured, resulting in a differential pressure which is proportional to the flow rate. Segmental and eccentric orifice plates are functionally identical to the concentric orifice. The circular section of the segmental orifice is concentric with the pipe. 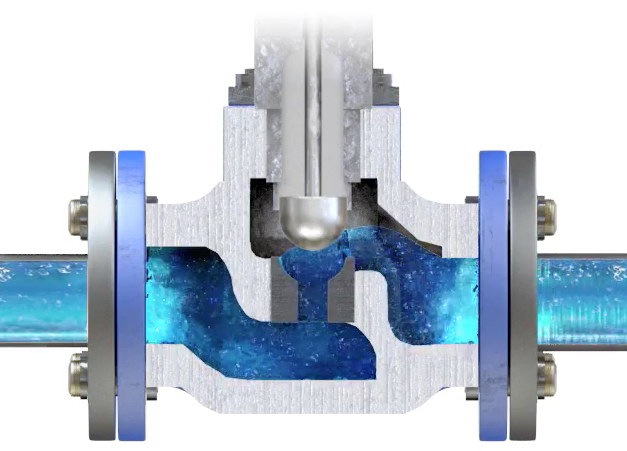 The segmental portion of the orifice eliminates damming of foreign materials on the upstream side of the orifice when mounted in a horizontal pipe. Depending on the type of fluid, the segmental section is placed on either the top or bottom of the horizontal pipe to increase the accuracy of the measurement. Eccentric orifice plates shift the edge of the orifice to the inside of the pipe wall. This design also prevents upstream damming and is used in the same way as the segmental orifice plate. Orifice plates have two distinct disadvantages; they cause a high permanent pressure drop (outlet pressure will be 60% to 80% of inlet pressure), and they are subject to erosion, which will eventually cause inaccuracies in the measured differential pressure. Contact TECO with any process flow question or requirement. You can find them by visiting https://teco-inc.com or by calling (504) 833-6381. The design and operation of industrial control valves is very important to understand if you work as a process engineer, a plant maintenance person, or if you design process control loops. Control valves are used extensively in power plants, pulp and paper mills, chemical manufacturing, petro-chemical processing, HVAC and steam distribution systems. There are many types, manufacturers, body styles, and specialized features, but the they all share some basics operating principles. The video below explains components, operation, and fundamentals. TECO designs automated control valve systems for all major industries including chemical, pulp and paper, petro-chemical, power generation, and water treatment. TECO’s experience and engineering background make them a uniquely qualified partner for your next automated valve requirement. process instrumentation. The Fischer and Porter brand has long been associated with an industry-leading range of flow measurement products. The legacy is strong though, and despite the F&P brand being shelved, their rotameter (variable area flowmeter) line is still referred to by some old-timers as "Fischer and Porter Rotameters" or "F&P Rotameters". In 1994, Fischer & Porter was acquired by Elsag Bailey Process Automation as a strategic union to blend Elsag Bailey's expertise in distributed systems with Fischer & Porter's expertise in process instrumentation. In 1999 ABB acquired Elsag Bailey and moved the F&P products in to a larger portfolio of ABB process instrumentation and the Fischer and Porter line of rotameters became known as ABB rotameters. 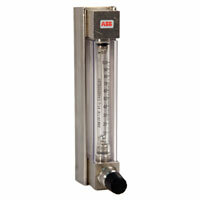 Today, Fischer & Porter products are fully integrated into the ABB portfolio of process instrumentation products which include variable area flowmeters (rotameters), magnetic flow meters, vortex shedding meters, and mass flow meters. In 1947 Thompson Equipment (TECO) was the first firm ever appointed to represent and sell the Fischer & Porter Rotameter line. TECO proudly continues that relationship today and specifies, services, and sells ABB Rotameters nationwide. TECO also maintains a large inventory ready for same-day shipment. For more information, visit https://teco-inc.com/ABB or call 800-528-8997 for immediate service. Belt conveyor scales have become an important part of most bulk material handling facilities. However, being relatively unobtrusive in most conveyor systems, they are often overlooked or ignored after their initial installation. Lack of simple maintenance will potentially cause significant reduction in the accuracy capabilities of these instruments. 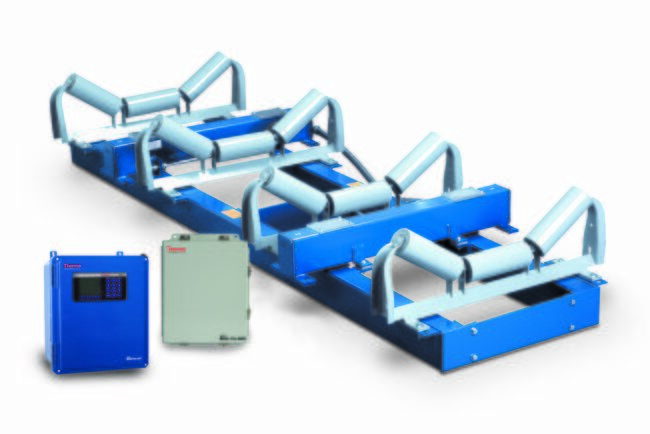 Most belt conveyor scales are capable of providing reliable results within ±0.50% of their full-scale rating. Belt conveyor scales that have been certified via the National Type Evaluation Program (NTEP) are capable of providing results that meet the criteria of the National Institute of Standards and Technology (NIST) Handbook-44, which is 0.25%. This is defined as being within 0.25% of actual material load and repeatable within a 0.25% bandwidth. Regardless of the accuracy capability of the scale design, it is unlikely that these devices will perform as promised if simple maintenance procedures are not strictly adhered to. Every scale installation will develop its own set of operating characteristics; therefore it is absolutely necessary to monitor the scales performance and provide routine maintenance as required. It is generally advised, throughout the belt scale industry, that calibration checks be made frequently during the weeks after initial installation, then to increase the time frame between calibrations as statistical results are obtained. While this is a simple suggestion to follow, all too frequently the increase in time between calibration verifications defaults to only whenever a problem is suspected. By then it is too late, incorrect weighments have been made, processes have been interrupted and inventory levels need other means of verification. Establishment of a routine inspection procedure, including not only the belt conveyor scale, but the entire material handling system, will result in an increased confidence in the scale and ultimately greater control of the accuracy it is providing. 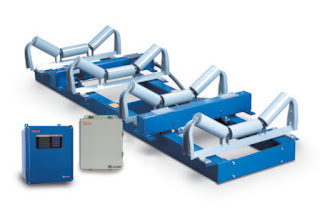 It is important to remember that the entire conveyor that the belt scale is installed in becomes part of the “weighing system,” and that any changes that occur or are performed within this conveyor can and probably will affect the performance of the scale. Therefore, in addition to a routine scale maintenance procedure it becomes imperative that any and all maintenance performed on the conveyor be reported to the individual or department responsible for the scales performance. Verification of the basic mechanics of the conveyor system itself is an integral part of the scale maintenance procedure. 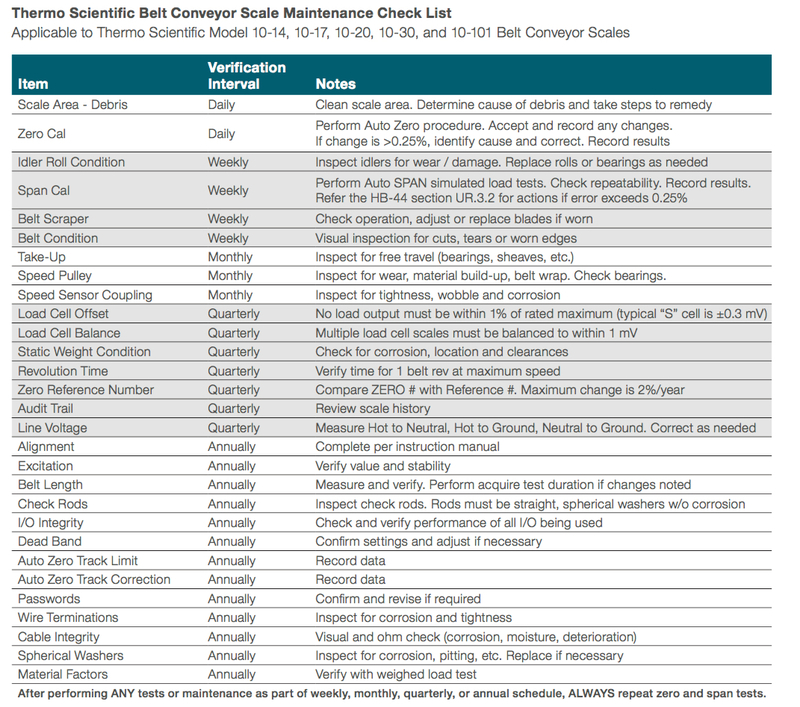 Please see Thermo Scientific Belt Conveyor Scale Maintenance Check List below. 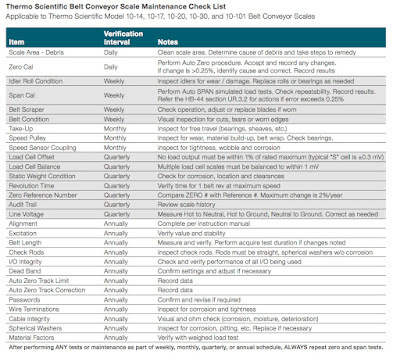 Download the PDF version of Thermo Scientific Belt Scale Maintenance here.